I’m as excited as the next person about what Ol’ Matt has been doing lately, more so even. Mud, Dallas Buyers Club, The Wolf of Wall Street, Interstellar; all more than solid, signaling a change in his acting career. And while every Hollywood leading man does a movie like this at some point COU*The Patriot*GH, I’m betting that it doesn’t actually work. The story looks too emotional, albeit true, and the film is sure to be chalk full of dramatic cliches. I do like Jacob Lofland though (Mud, Little Accidents); too bad he dies early. 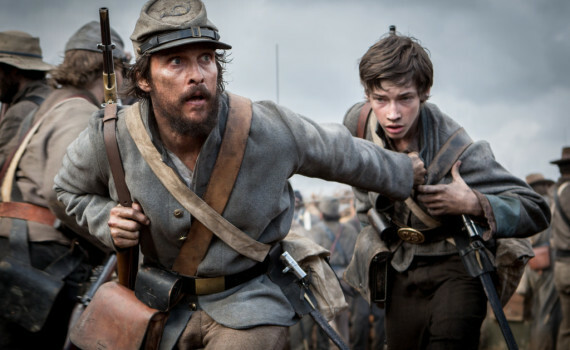 I just wish I could be more excited about what seems a good premise, McConaughey in a Civil War movie. But this just may not be the gem I’m hoping for; I guess you could say I’m hedging my bets.